I'm not sure what the question is, but the answer is almost always chocolate! Start off by sprinkling the crushed biscuits all over the base of the tin. Next, break the chocolate into sections and put them in a heatproof bowl together with the liquid glucose and the rum. Fit the bowl over a pan of barely simmering water, then leave it until the chocolate has melted and become quite smooth. Stir, then take off the heat and leave the mixture to cool for 5 minutes or so until it feels just warm. Now, in a separate bowl, beat the cream until only very slightly thickened. Fold half into the chocolate mixture and then fold that mixture into the rest of the cream. When it is smoothly blended, spoon it into the prepared tin. Tap the tin gently to even the mixture out, cover with clingfilm and chill overnight. Just before serving, run a palette knife round the edge to loosen the torte, then give it a good shake and turn the whole thing out on to a serving plate (don't be nervous about this – it's very well behaved). 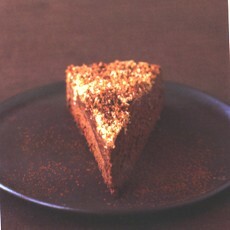 To serve, dust the surface with sifted cocoa powder and, if you like, mark the top into serving sections. Have some chilled pouring cream to go with it; if you have any, a couple of tablespoons of amaretto liqueur makes a wonderful addition to the cream. The second is an old favourite - from a cookbook I bought when we were first married. My father-in-law loves this. In a bowl mix together 100g soft margarine, 100g granulated sugar, 2 beaten eggs, 75g self-raising flour and 25g drinking chocolate powder. Beat well to make a smooth mixture. Transfer mixture to greased dish and level the top. Mix together 25g cocoa powder, 40g chopped nuts and 50g demerara sugar and sprinkle over sponge mix. When cooking the sponge mixture rises over the coffee, giving a thick fudgy sauce underneath. Serve hot. Good with cream or vanilla ice cream. oh wow...yeah passing these over to T so i can get some answers...smiles. Not a chocolate lover, but just posted a photo to Flickr with a reference to "chocolade"...apparently the Dutch word for chocolate, but what was it doing on a sign in Albi? @ Betty - oh yes, I'm a great believer in serendipity, online & off. And thanks for the flickr link. Yum. Letty's sister did good! :) Looks delish!! I'm not quite sure how "liquid glucose" translates across the pond? I can't seem to remember any recipes calling for it over here ?